Renowned for their environmental benefits and their skin friendly composition Moltex Nature No.1 Disposable Nappies are the increasingly popular choice of disposable nappy for busy parents seeking an alternative to conventional disposables. .
Moltex has also been awarded the Green Brand award for 2015/2016, which is a seal of quality for environmentally sustainable products. Much better for the environment than conventional disposables and kinder to babies' skin, Moltex Nature No.1 Nappies and are free from chlorine, latex, perfumes or lotions and are therefore perfect for baby’s sensitive skin. Recommended for babies with eczema and other skin problems. Made with up to 50% renewable raw materials, FSC certified cellulose derived from wood. 1. Dry to the touch: The 3-layer absorber ensures rapid liquid absorption. Added tealeaf extracts neutralize odours effectively without the need for perfumes or lotions. 2. Elastic waistbands available in six sizes from newborn to XL so a perfect fit is ensured for your baby. 3. And the completely breathable clothing protection film provides for excellent nappy ventilation. Get mroe for your moeny with a jumbo box. 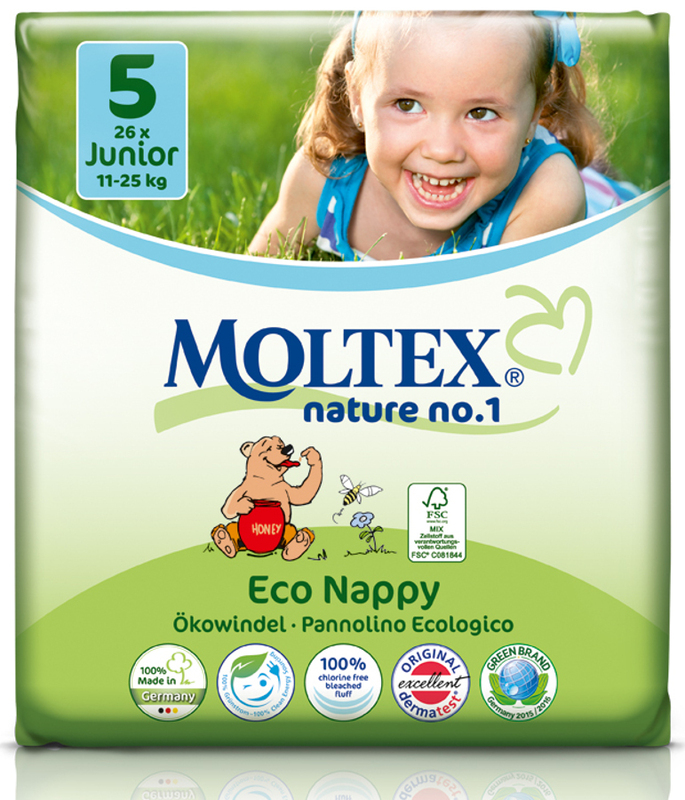 The Moltex Nature Disposable Nappies - Junior - Size 5 - Pack of 26 product ethics are indicated below. To learn more about these product ethics and to see related products, follow the links below. I really like Moltex nappies, the best I came across so far. Have been using Moltex for a long time. Before Moltex I liked Huggies. I found every other "big brand" rubbish. From Moltex my son did not get any reaction as oppose to othere brands. Also excellent absorption qualities!I will keep buying it as long as we need it. and for the next baby too. 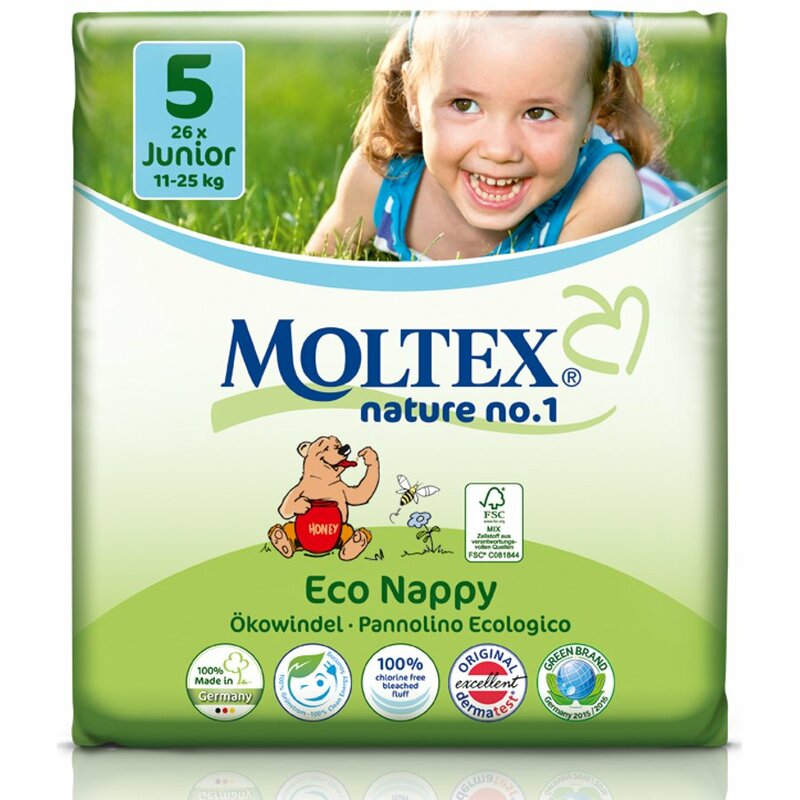 There are currently no questions to display about Moltex Nature Disposable Nappies - Junior - Size 5 - Pack of 26. Moltex Nappies are eco disposable nappies and don't cost the Earth! They have all the features of leading conventional disposables but are much kinder to your baby's skin and the environment the natural choice for parents who need to use disposables but are worried about the impact on the environment.